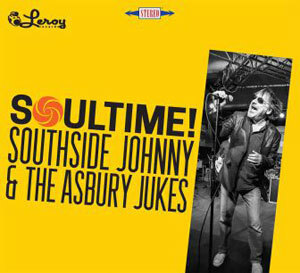 CD: Southside Johnny & the Asbury Jukes - Soultime! Soultime!, the first Jukes studio album since 2010's Pills and Ammo, is exactly what it says on the package. It's hard to imagine a stronger collection of vintage-sounding contemporary soul than this eleven-track release. Much like 2000's Messin' With the Blues, Soultime pays tribute to a style of music that is clearly held in high regard by Mr. Lyon and his cohorts, and -- perhaps more importantly -- is clearly understood by them, as well. The album kicks off with "Spinning," a Sam & Dave-esque treat in the best tradition of "Broke Down Piece of Man," which appeared on I Don't Want to Go Home, the Jukes' debut. On that 1976 cover, Johnny sparred vocally with Little Steven, but on this new original, co-writer/co-producer/keyboardist Jeff Kazee provides the vocal foil, and the results are fantastic. Soultime! goes on to take in the entire spectrum of vintage soul throughout its eleven tracks. Curtis Mayfield's Chicago soul/funk provides inspiration for a couple of the tracks (the "Move On Up"-influenced "Looking For a Good Time," and the "Pusher Man"-sounding "Reality"), while the Motown male group sound is represented by "I'm Not That Lonely." It's worth mentioning the fact that Southside had a hand in composing each of the eleven cuts on Soultime. He and Kazee have become a songwriting machine at this stage, co-writing nine of the tracks on the album in addition to sharing the production duties. The result -- 42 minutes of soul/R&B tunes that manage to sound familiar and modern without sounding derivative, cartoonish or retro -- is superb. Soultime! contains a couple of tracks that might surprise even long time Southside-watchers: an uncommon instrumental, "Klank," that touches on the kind of soul groove that was coming out of Philadelphia in the 1970's, and "The Heart Always Knows," a tasteful homage to the pre-soul era of R&B as typified by the likes of Ben E. King and Sam Cooke in the late '50s and early '60s. Both serve to mix up the proceedings a bit, while adding to the overall feel of paying tribute to one of the greatest of American musical genres. At this stage of the game, Southside has long become a legend in his own right, and while not as well-known as the heroes whose influence reigns over Soultime!, his commitment to the blues and R&B side of American roots music is clear. If anything, his voice -- that voice -- has, through a combination of age and experience, become even more suited to sing the kind of music that he and the Jukes inherently understand.